For the second day of Healthy Diet / Diabetic Diet, I have a simple tikki that turned out to be delicious and quite handy to tuck inbetween the bread to make a hearty meal by itself. I had the yellow peas soaked to make some sundal, and it turned out that we just couldn’t cook it as planned. We finally cooked it and still left with major part of it behind, when we thought we could make tikkis out of it. Peddu especially loves these tikkis between his bread slices and loves to think he has a perfect burger in hand. So as much as we can plan, we do make these healthy tikkis with all dried lentils that we can plan. Wash, soak the yellow peas overnight. Pressure cook with enough water till done. Allow to cool and grind to a paste. Heat a non stick pan with oil, add cumin seeds, finely chopped green chilies, and grated ginger. Saute well. Now add mashed potatoes, and all the spice powders. Mix well and then add the ground peas paste. Adjust for seasoning. Allow to cool and divide into small balls and flatten. Roll the tikkis on oats powder. Heat a non stick pan and drizzle with oil. Pan cook the tikkis till the top browns well. Makes a delicious cake in between the bread. 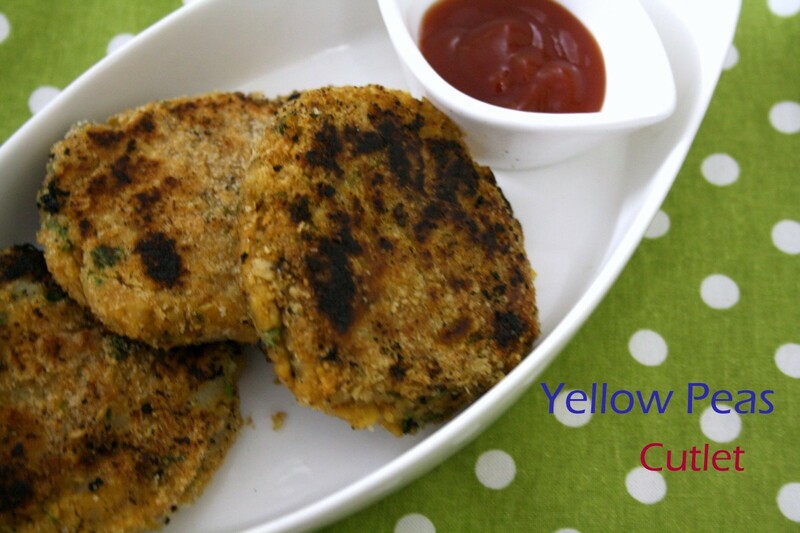 Serve this tikki with some ketchup, can have it for my snacks without any guilt, nutritious snacks. Must have been tasty and healthy tikkis. Very nice. Love the idea of using oats for rolling instead of bread crumbs. 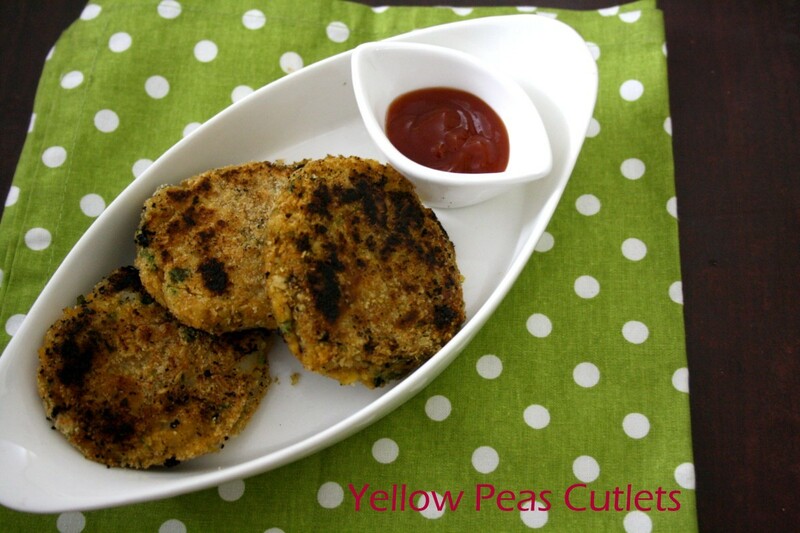 Tikkis are an all time favourite with me , yellow peas sounds interesting ! I love tikkis and these are very healthy ! will try out soon ! These type of tikkis are very popular at home. Shall have to try these out too.